It figures. 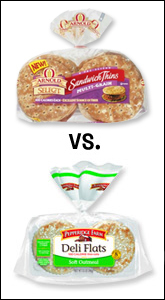 We'd FINALLY started to find the Sandwich Thins in our 'hood when these Pepperidge Farm Deli Flats began popping up. They're nearly identical -- both taste great and are packed with fiber. We like good healthy competition as much as anyone, so we're basically going to buy whichever is easiest for us to find. (You hear that, food companies?) If forced to choose, we'd go for the Arnold/Brownberry/Oroweat version. But really, there are no losers in this battle. These things ROCK, and we hope they're here to stay. Now don't get us wrong -- we LOVE both of these products (as we do all the items we're talking about today). But when someone loves Popchips as much as we do, they're gonna be pretty excited to see a product that tastes just as good, but for a lower price. As exciting as that is, however, the TJ's chips don't come in all the fabulous flavors and packaging options that Popchips do, just Salted or Barbecue in multi-serving bags. Plus, some areas don't have Trader Joe's. Popchips, have no fear... Your delicious empire is safe. We've been listing these products as interchangeable FOREVER. It may seem like MorningStar's version has more calories, but check out the serving sizes -- it actually has the same amount of calories as Boca's. 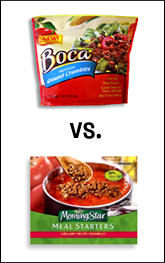 Both have a nice ground-beef-like taste, both are super-convenient ways to jazz up plain food items (hey there, Tomato Bisque! ), and both come frozen. The difference? Well, the new Boca bags are re-sealable. Unfortunately, the Boca crumbles are harder to find in our area, so we're content to keep stuffing our MorningStar Farms bags into Ziplocs to keep the little soy crumbles from getting all over our freezer. Whichever we can get our hands on, we'll buy. Now that Fiber One makes EVERYTHING, it's not surprising to see it pop up again on this list. As big fans of the F1 brand, especially these Chewy Bars, seeing knock-off fiber-filled gooey bars makes us a little sad... and a little happy. Both brands make a simple chocolatey variety, but the FiberPlus bars also come in a Dark Chocolate Almond flavor, which is kinda cool. 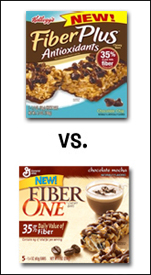 However, the folks at Fiber One are continually cranking out new flavors (Oats & Apple Streusel! Chocolate Mocha!) -- that's pretty hard to top. F1 ROCKS!!! Want More HG? - Like us on Facebook! You'll get behind-the-scenes info, you can connect with other HG fans, and you'll be able to instantly weigh in on random pop-up poll Qs. Woohoo! Friday, July 31st, is officially the last day of July! Starting Saturday, it's National Brownies for Brunch Month... or, you know, August. Make some Yum Yum Brownie Muffins to celebrate -- they're TOTALLY brunch-worthy. What are you waiting for? This email isn't going to click "send to a friend" by itself. Pass it along NOW!